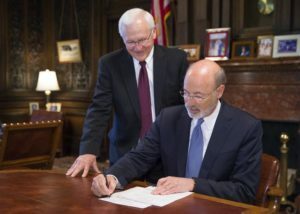 HARRISBURG – State Senator Gene Yaw (R-23) joined Governor Tom Wolf last week for a ceremonial bill signing at the State Capitol Building that marked the passage of legislation aimed at curbing Pennsylvania’s heroin and opioid epidemic. Approved by the Legislature last October, Act 124, formerly Senate Bill 1202, was introduced by Senator Yaw and Senator John Wozniak (D-35). The bipartisan legislation requires prescribers and dispensers to obtain initial and continuing education in pain management, identification of addiction and the use of opioids as effective treatment. The new law also requires prescribers and dispensers to check Pennsylvania’s Prescription Drug Monitoring Program Database (PDMP) each time a patient is dispensed an opioid drug product or a benzodiazepine. Additionally, prescribers and dispensers are now mandated to update the PDMP within a 24 hour period, or “by the next business day.” The previous requirement was within a 72 hour period. Additionally, Act 125, formerly Senate Bill 1367, was also sponsored by Senator Yaw, and limits prescriptions designated for minors to a seven-day duration, unless there is a medical emergency that puts the child’s health or safety at risk. The law includes exceptions for cases involving chronic pain, cancer treatment or for palliative care or hospice care. In those cases, the medical professional would be required to document the acute medical condition in the minor’s record with the prescriber and indicate the reason why a non-opioid alternative is not appropriate to address the acute medical condition. “The drug epidemic is a non-partisan issue and I thank the governor for his involvement and support,” Sen. Yaw added. State Sen. Gene Yaw (R-23) joined Gov. Tom Wolf at the Capitol as he ceremonially signed two new laws addressing opioid addiction, abuse and misuse.